In august 2016 I cycled from Joure to Urk. This route passes a 25 kilometers long dike between Lemmer and the former Zuiderzee island Urk. It is a unique dike because of its history, length and 25 kilometers uninterrupted long view from the dike to the IJsselmeer. No motorcyclist are allowed on the dike. The dike was constructed in 1939 from the mainland Lemmer to the island Urk, just as the Afsluitdijk project was changing the salt water Zuiderzee surrounding Urk to the less saline IJsselmeer. A couple of years later, in 1942, the seabed areas surrounding Urk were reclaimed from the sea and became the Noordoostpolder. The view from the dike is towards the IJsselmeer. But there are some ‘fly-overs’ in the dike, of which one can see the wideness of the Noordoostpolder. It was my first time passing this dike and I was impressed by its length, the views from the dike to the IJsselmeer, the rest, the rows of windmills in land and see, the many sheep and birds and the views over the reclaimed land on the backside of the dike. I felt history also. 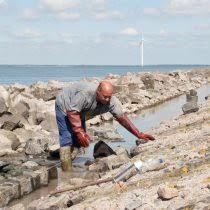 History was even more felt, when came across a stone setting worker on my way up to Urk. He took my attention because of his ongoing and calm hand work in combination with these large basalt stones. It made me think of the construction of the Afsluitdijk in the thirties of the last century. I told him so. During our combined lunch the nice man told me the construction and maintenance dike work nowadays is indeed the same as the work in those days. ‘I am one of them left of the 27 stone setting workers left in the Netherlands. I am glad too. It is work which cannot be done with machine work. We do get assistance from dike workers, but the real stone setting work has to be done by hand. People has tried with machines, but it did not work out. To be honest, I am glad with this, it means work to me, work I like. The work can be hard, but most important is gaining skills on it. The man explained also he and his colleague work from Monday till Tuesday on this project. On Friday, they travel home to their families in the province Zeeland. On Monday they return to their host families in Lemmer. Thanks to Harry Neels, Yrseke, also for sending me a couple of days later a copy of his course book from 1992 for education to stone setting worker. 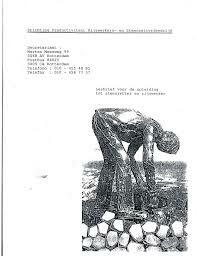 The front of the book shows the picture of the sculpture called ‘steenzetter’ (stone setting worker), made by artist Ineke van Dijk for the Afsluitdijk and unveiled in 1982 by former queen Beatrix. Nowadays, people can still be trained to become a stone setting worker.